The C33 was released in 1965 as part of the Mamiya C series of interchangeable lens medium format TLR cameras. 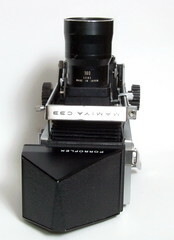 It is an improved version of the Mamiya C3. A few months after introduction a knob advanced version was released as the Mamiya C22. 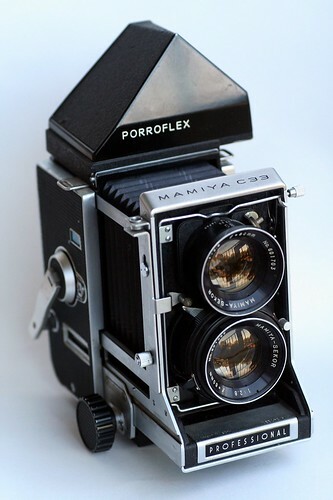 It was succeeded by the Mamiya C330. 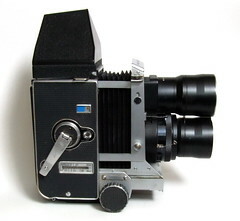 Like the C3, it uses a film advance crank, but in addition it supports cocking of the shutter automatically during the winding stage. After turning the crank clockwise it automatically stops. It is necessary to return the crank by rotating it counter clockwise until it stops. A new dedicated lens distance scale window is on the right hand side of the body. It provides scales with focal lengths of 65mm and 80mm. The left side bellows plate has distances scales for 105mm (chrome), 135mm and 180mm lenses. Some models have additional scales for 55mm and 250mm lenses. The lens parallax selection knob is on the left hand side of the body, it has settings for 80mm, 105mm, 135mm and 180mm lenses. Using the 65mm lens requires setting the knob on 80mm and using a 65mm mask. The lens locking clamp hinge has changed to the right side of the body. That space is now occupied by a cable release connector instead of the lens clamp lever. There is a red window with a cover on the film back, since this is an automatic camera aligning the backing paper with the window is unnecessary. The window is only used to check the presence of film. 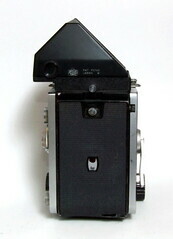 The C33 is primary a 120 film camera, but there are variations that have a 220 film back fitted. Leatherette was not used for the covering. Instead a proprietary Mamiya covering is used with a tiny raised letter 'M'. This page was last edited on 20 May 2014, at 06:51.